Gladioli (Gladiolus spp.) are natives of the Mediterranean and come in nearly 10,000 different varieties, according to the Floridata site. The plants produce tall, upright spikes of blooms in shades of yellow, orange, red, pink, purple and white. The blooms can also be bi-colored. Soaking gladiolus prior to planting helps in rapid germination. Gladiolus is widely used in fresh flower arrangements. Gladiolus grows from underground, bulb-like structures referred to as corms. In his book "Growing Flowers for Profit,", Craig Wallin recommends soaking the corms in plain tap water a day before planting. Plant gladiolus anytime between early May to the middle of June, advises Ronald C. Smith of North Dakota State University Extension. Plant larger corms at a depth of 6 inches, and space them 6 inches apart. Plant medium-size corms 4 to 5 inches deep, and space them 3 to 4 inches apart. Plant smaller corms at a depth of 3 inches with 2 inches between each. 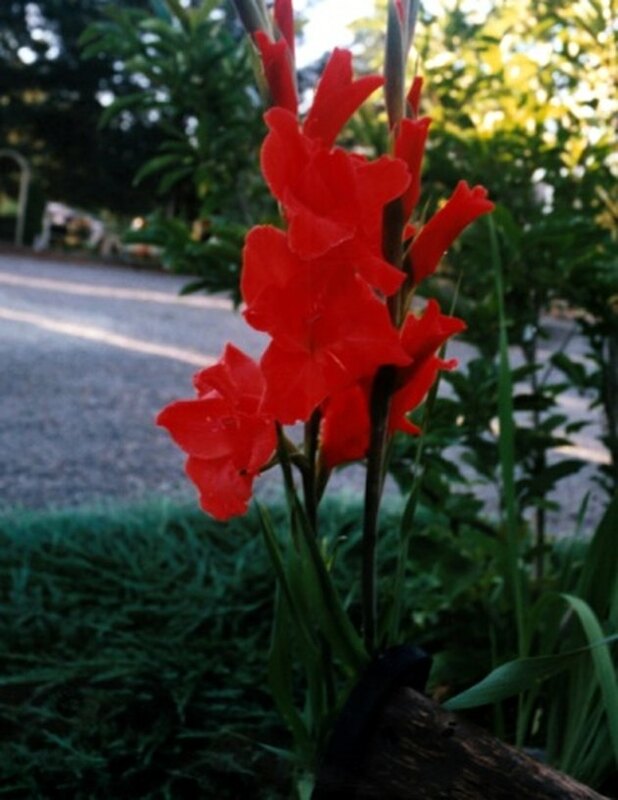 Gladioli grow well in areas of full sun to partial shade and in a well-drained, fertile ground. The flowers are hardy in USDA Zones 7 to 10 and are not winter-hardy in areas where the ground freezes. Stake the taller varieties to keep the plants from falling over.